Today June 1st , Transilvania International Film Festival will open its doors to the audiences. One of TIFF’s most expected programs, Romanian Days, will present some of this year world premieres and recent productions. 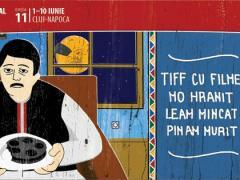 Eleven feature films and 16 shorts will be screen in Romanian Days from June 6th till June 9th. The selection includes recent Romanian productions: Everybody in Our Family, Radu Jude΄s family-drama with thriller accents; Somewhere in Palilula, directed by the acclaimed theatre director Silviu Purcarete; Tudor Giurgiu΄s second feature, Of Snails and Men; and Adrian Sitaru΄s Best Intentions, winner of Best Director and Best Actor (Bogdan Dumitrache) at Locarno 2011. This year, for the first time in Romanian Days, the filmgoers will get a chance to see a Romanian feature animation film Crulic - The Path to Beyond directed by Anca Damian. Selected in festivals worldwide, the film was also in competition at the most prestigious festival for animation in Annecy, France. This year, the Jury for Romanian Days is composed of Michel Ciment, film critic at Positif and author of more than 15 books on cinema, Guilhem Caillard, film critic at Panorama-cinéma and selector for Cinemania Film Festival, Montreal and Vicenzo Rossini, Artistic Director for Milano International Film Festival. The Jury will award the Romanian Days Award for Best Feature Film and Best Debut. Killing Time, directed by Florin Piersic Jr.